I gave a talk in the IMS seminar today trying to convince everyone of the wonders of next gen sequencing! Abstract: Unprecedented environmental changes are occurring in the polar regions and climate models suggest that these changes are only accelerating into the future. Changes in temperature, sea level, ocean alkalinity and sea ice cover are expected to alter ecosystem structure and function, but how? The changes are complicated and are happening quickly, but difficulty of access and limited baseline data make the poles challenging environments to conduct research in, which is why it is imperative to increase the sensitivity and sophistication of our methods as well. Paradigm-disruptive advances in DNA sequencing technologies are offering deeper views into biology at all levels, and particularly in the microbial realm. However, in the polar marine sciences we have only begun to take advantage of these advances to study the diversity, evolution, distribution, function, and future of life in the polar seas. 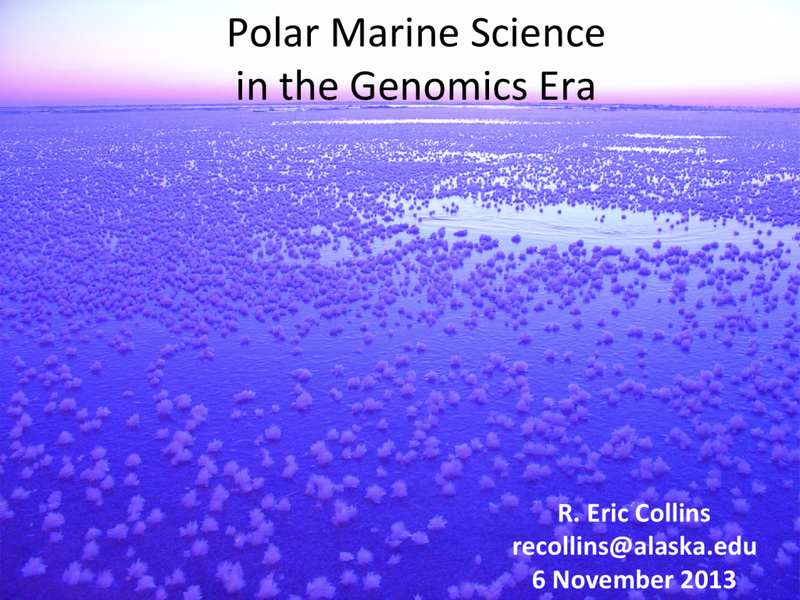 I will review the state of the art in next-generation sequencing technologies as applied in the Arctic and Antarctic, and provide some thoughts on potential uses for these technologies in Alaskan waters. Here are some questions that students had after the talk, I’ll go through and provides answers here when I can. 1. Is there a rush to be able to define bacterial “species”? What benefit would that provide and would it even be a trustworthy delineation? 2. How will these technologies be applicable outside of the micro world? I would love to be able to apply to my “macro” research, but I’m having trouble thinking out of the box. 3. How do Arctic and Antarctic genomes overlap and interrelate? 4. How might you back-calculate speciation forcing variables, i.e., temperature vs oligotrophic conditions etc? 5. What will be the scope of the pan-Arctic metagenomic analysis? Eukaryotic or prokaryotic? 6. What is Gcore vs. Gpan? 7. Why would we want to define bacteria into species? 8. Why is there a lack of samples from the polar regions? What are the implications of increasing the polar regions’ bacteria list?